Functional plugin Wow Modal Window Pro for CMS WordPress is designed to ease the process of creating and setting the modal windows on the site. With the help of this plugin it is possible to monitor pop-up informational blocks flexibly. It allows to conveniently change the contents and parameters of its display. Characteristic features of this solution are the simplicity and efficiency of use. preview of information blocks in the editing process. The plugin is a “flexible” modern solution for efficient work with modal windows. create and insert the form of subscription or feedback. The Wow Modal Window Pro plugin serves to create, optimally configure and easily manage the pop-up information blocks on the site. A user-friendly interface makes it easy to understand the settings of the functional tool. functional pop-up panels and much more. 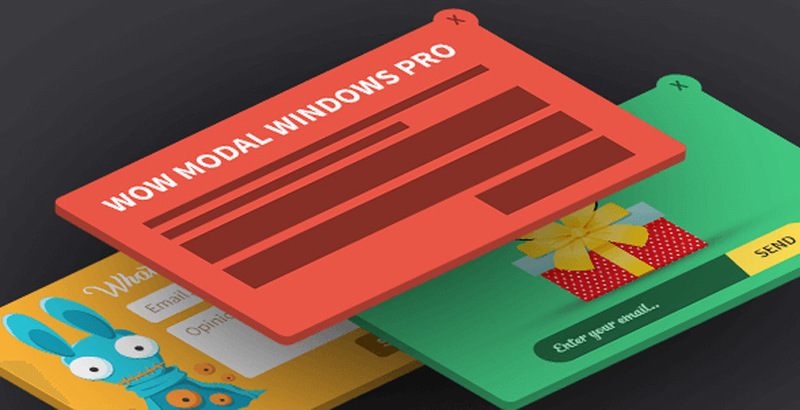 The Wow Modal Window Pro is the modern tool to create functional modal windows with an original design. By purchasing the plugin, you get the option of detailed customization and personalized use of pop-up messages on the site. The extension allows you to change the display options depending on the needs of the target audience. Installation of the plugin will positively affect the increase in the conversion of the web resource. 1. Download the plugin from the source to your computer. 2. After you download the plugin to your computer, if it’s in a compressed Zip file, unzip it to access the uncompressed files. If the file is zipped (compressed), use a free web application (such as WinZip) to unzip the plugin. 3. Connect to your server using your preferred FTP application. 4. Navigate to the wp-content folder within the WordPress installation for your website. 5. In the wp-content directory, find the plugins directory; upload your plugin to this location via FTP. Congratulations — your plugin is installed, but you still need to activate it. 6. Choose Plugins→Plugins on your Dashboard. The Installing Plugin page appears. You can generate the invoice in your Dashboard on Wow-Estrore.com. The plug-in is easy to use and creates great results. I had a problem with the plug-in after a WordPress update, but the issue was fixed within a day and is now working fine again. Definitely recommended! Has solved several technical conflict issues for us. Keep up the great work! So far very pleased with the plugin. I have been looking for a plugin like this. Great help from the team, when you purchase the wrong license – you get a new code no problem. If you’re looking for a modal plugin that you can easily (and quickly) add to your WordPress website, this is a sound choice. I’ve used it to display multiple links to different contact forms on a contact page and I’m sure I’ll find many other uses too. The setup is very clear and the ways to launch the modal easy to understand and add to your pages. A very useful plugin. Really great plugin, easy to use, creates great popups when and where you need them and not where you don’t! My favorite is the ever elusive exit intent which is responsible for the huge rise in my email subscribers. All kinds of modals, all you need and the ability to run scripts and shortcodes brings a whole new meaning to popups. I was looking for a plugin to simply add a nice little Side Menu to my wordpress site. In combination with Side Menu Pro everything is now as wanted. Thanks WOW-Team! Added: Support for display on taxonomy pages. Added: Show menu depending on user's role. Fix: Verifying access to the folder 'asset'. Fix: Support and Facebook link.